Spend a few minutes with Kim Lopez and one is immediately struck by her love of the Catholic faith. 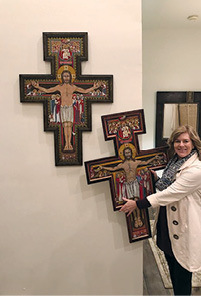 Artist Kim Lopez is shown holding a painting of the San Damiano cross that St. Francis was praying while receiving the stigmata. 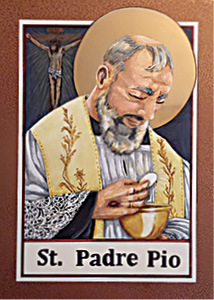 Lopez, a native of New Orleans and long-time resident of Baton Rouge, painted the cross for the John Paul II house at Christ the King Church and Catholic Center and also for Holy Rosary Church in St. Amant. Pictured on these two pages are examples of her stunning paintings. Photos submitted by Kim Lopez. Take some time looking at the artwork of the Baton Rouge resident and one has a glimpse into her heart, one that overflows with love, love of family, love of faith and a genuine appreciation of her life. Lopez is one of those rare individuals who has been able to share her love of Christ from her heart to the canvas. Since retiring from a Baton Rouge engineering firm several years ago, Lopez has turned her attention to painting religious art. And the results are stunning. Step into the new John Paul II house that is managed by Christ the King Catholic Center in Baton Rouge and one is welcomed by a stunning painting of the San Damiano cross that St. Francis was praying when he got his stigmata. Through art, the piece tells the story of the crucifixion and the risen Christ. The image is of the risen Christ, and all who were present at the foot of the cross, mourning their loss. Above the cross angels are shown singing glory. Also in the painting are the temple guard, Longinus and the crow who crowed three times the night of the Last Supper. A visit to Holy Rosary Church in St. Amant and one is greeted by even more of her artwork. In fact, she has painted at least 10 pieces for Holy Rosary pastor Father Josh Johnson, including one of the Sacred Heart for every room in his rectory. 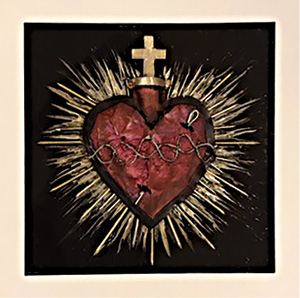 Father Jonson said Lopez created multiple pieces for him for the rectory so that whatever room he is in he can experience intimacy with Jesus. “I’ve always had a deep faith and I wanted to do something,” said Lopez, who had dabbled in art in her younger years and had been painting pieces more appealing to young people while her two children, including her son Jeremy, who is a seminarian, were being raised. Evidence of her work is displayed through her house, which she shares with her husband, located in the lakes area of Baton Rouge. Her first foray into religious art came abut 13 years ago when her family moved to Christ the King. By that time, her two children were old enough to allow Lopez freedom to spread her artistic wings. “I wanted to give back and felt like I wanted to give something to the priests (at CTK) to remember the parish by when they left,” Lopez said. She would ask the priest to “come pray about the image” or think about the image he might want. 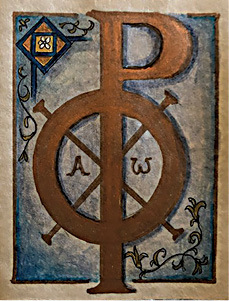 Painting religious art allows Lopez the opportunity to express what she wants to relay to people and to evoke emotions. Her artwork is also an opportunity for evangelization, explaining that a person might be on the fence regarding his or her faith but in “every little piece of work, you might see (something) supporting their faith, a belief so strong that that’s what is driving them. “Just like with (the crucifix), in every piece of art I’ve done I’ve gained knowledge,” Lopez added. “The people that are praying about it, they have insight and they have passed that onto me. Lopez, one of six children, was first introduced to the art world at the youthful age of four, when her mother sent her to Delgado Community College in New Orleans for an art class. She said a “really nice husband and wife” were her instructors. Lopez said she was thrilled when a collage she painted was published in the local newspaper. Her mom even saved the clipping, which Lopez was grateful for, especially since her older sisters were regularly in the newspaper for their exploits on the tennis court. “Our family is very artistic,” Lopez said, adding that her older sisters also dabble in art, particularly modern art. 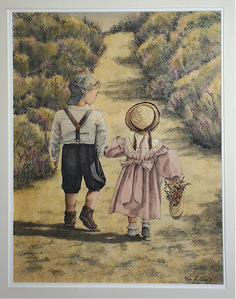 Although she does not have a count on the number of pieces she has painted, Lopez, who has given away most of her artwork to friends and family, is eagerly looking forward to taking on new artistic challenges. 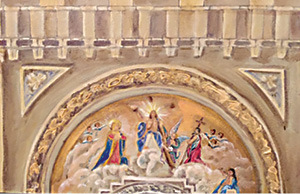 She is hoping to help with the artwork that will go into the new chapel at the John Paul II house, as well as assisting in other areas of the diocese. “If I’m touched by something I just want to be able to give,” she said, processing in her mind future possibilities.